NEW YORK -- In the lead-up to the 1960 Winter Olympics, Jack Leetch was one of the last players cut from the U.S. men’s hockey team. He missed out on what, until 1980, was considered a miracle on ice when the American team took home the gold medal in Squaw Valley. When he was dropped, Leetch told team management that he hoped someday he could have a son who could wear the U.S. colors. That son, Brian, wore the red, white and blue on a number of different occasions; those accomplishments, as well as his brilliant 18-year NHL career, made him a more-than-worthy recipient of the Lester Patrick Trophy, awarded for outstanding service to hockey in the United States. Leetch joined former fellow U.S. Olympian Cammi Granato, legendary hockey broadcaster and writer Stan Fischler, and long-time hockey publicist and historian John Halligan as honorees Wednesday in New York. While all four winners have Rangers connections — Granato’s brother, Tony, was a teammate of Leetch’s; Fischler has for decades broadcast Rangers games; and Halligan worked for the Rangers for nearly 25 years — it’s Leetch who was recognized as one of the greatest to ever pull on the team’s sweater. Leetch was born in Corpus Christi, Texas, but grew up in Connecticut, about halfway between Boston and New York. While he wasn’t far from Broadway, he never thought he’d play the world’s biggest stage. Instead, Leetch focused on baseball, where he developed into a pitcher with a 90 mph fastball and a future major league batterymate. “Brad Ausmus (a 14-year major league veteran catcher) says, ‘You could throw hard enough, but then you’d have to learn how to pitch at the next level,’ and he’s caught a few guys who threw pretty hard,” Leetch said. Leetch never set his hockey goals very high. “Early on I thought maybe the Olympics were a possibility and representing the USA, and that’s because of USA Hockey giving me the opportunity as a 15-, 16-, 17-year-old to start playing international games,” Leetch said. He played well enough in those international games to be picked ninth overall by the Rangers in the 1986 Draft. “I knew when I got drafted in the first round, I would have an opportunity to play,” he said. “A team doesn’t risk that draft pick without giving that person an opportunity. You’re going to get training camps, you’re going to get opportunities with the big team or the minor-league team to play. That’s an understatement if there ever was one. By the time Leetch was done, he was the Rangers’ all-time leader in assists (741) and was second in points (981) and games played (1,129) over a 17-year span. He played a half-season with the Toronto Maple Leafs and one season with the Boston Bruins, finishing his 18-season NHL career in 2006 with 247 goals, 781 assists and 1,028 points in 1,205 regular-season games. His performance with the team, especially in the 1994 Stanley Cup Final, is one that never will be forgotten. In 23 games, Leetch led the team in scoring with 30 points, and his 11 goals were second on the team only to Mark Messier. None was bigger than goal No. 11, which came in the first period of Game 7. Leetch took a pass from Sergei Zubov, and with an eternity and an open net to shoot at, he buried the shot. “He had the ability to take that puck, with everything riding on the line, to make sure that he settled it down, picked his spot and was present enough to know he had the time he did,” said Mark Messier. 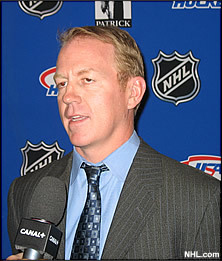 In his 18-year career, former NHL defenseman Brian Leetch totaled 247 goals, 781 assists and 1,028 points in 1,205 regular-season games, with one Stanley Cup championship. The goal sparked the Rangers to their first Cup since 1940 — and helped to earn Leetch the Conn Smythe Trophy as playoff MVP. He’s still the only American-born player to be so honored. Leetch also represented the United States in three Olympics — 1988, 1998 and 2002 — winning the silver medal with the 2002 team. He also captained the 1996 U.S. team that won the World Cup of Hockey. Leetch is known just as much for his modesty off the ice as he is for his prolific playing career. Leetch will have another humbling experience on Jan. 24, when the Rangers retire his No. 2. That’s also what Leetch is doing now, spending time at home with his wife and his three children, and doing a little coaching for his oldest son’s team of 7-year-olds. Eventually, though, he’d like to get back into the game. For now, though, he’s happy living the quiet stay-at-home life. But for Rangers fans, they’ll always hold No. 2 in a special place.